(Mexico City, 1972) Poet, performer and editor. Her most recent books are Knotten vortex (Phoneme Media) and Materia oscura (Parentalia), both of 2018. 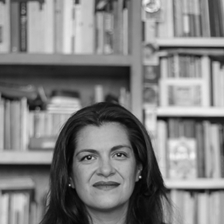 She has been awarded the 2015 Best Translated Book Award for Diorama, translated by Anna Rosenwong, the 2000 Gilberto Owen National Literature Award and the 2005 See America Travel Writer Award. Her poetic performances have been shown at international venues such as the Cervantes Institutes in Berlin, London and Stockholm; the Pompidou Centre, Paris; the Southbank Centre, London, and others. Her poetry has been translated into more than ten languages. You can read, see and hear her work at rocioceron.com.